There are not many all-natural amino acid formulations on the market today, which makes it hard to find a healthy way to give your body the amino acid nutrition that it deserves. Balance Amino Complex is completely devoid of anything artificial, making it fine for regular use and supportive of general health. After all, we have to look after our entire body, not just our muscles ... right? Balance Sports Nutrition, with their all-natural range of supplements, are expert at providing market-leading supplements that are cleaner and more efficacious than most. Never has a gas been spoken of with such excitement than Nitric Oxide. The complex field of sports nutrition research has been shifting of late with more of a focus on nitric oxide, a natural gas produced within the blood vessels. This gas has many biological functions, the most popular of which is its ability to relax the smooth muscles that surround blood vessels and control dilation and constriction. If we can dilate a blood vessel, this allows, with each contraction of the heart, more blood to be shunted, thus accelerating circulation. And with more blood comes more oxygen, glucose and amino acids—the nutrients that working muscles need to stay functional. For this reason, many sports scientists have been scrambling to understand this novel gas and its implications for athletes and sportswomen and men. Beetroot contains natural compounds, called nitrates, which function through a nitric oxide synthase (NOS) independent pathway to support nitric oxide synthesis1. NOS is an enzyme that converts arginine—also contained in this product—to nitric oxide. Therefore, Balance Amino Complex has got the body's two major nitric oxide synthesis pathways covered. Balance Aminos contains all of the essential amino acids required for repairing and growing muscle tissue, with a particularly high concentration of branched chain amino acids. Essential amino acids have been demonstrated over the past few decades, countless times, to stimulate muscle protein synthesis2. When taken intraworkout, this product will help to counter the cortisol elevations seen in high intensity exercise by increasing anabolic signals3. Furthermore, there is a hefty 2,000mg of glutamine per serve, a conditionally essential amino acid that may assist with immunological function and gut health. More specifically, glutamine has been shown to increase muscle power (peak torque), decrease muscle soreness and support glycogen accumulation after training4,5. 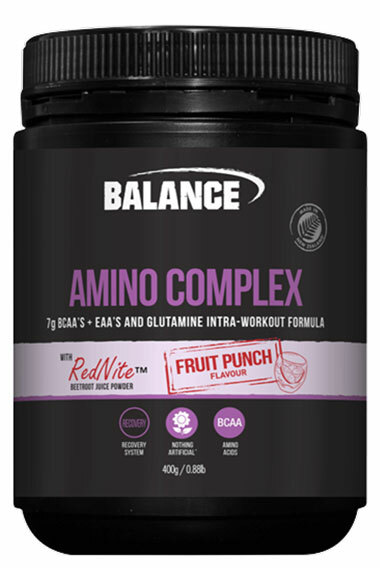 Balance Amino Complex is a great all-round supporter of high intensity training, though it can be used by anyone who wants to get a little more out of the time they spend exercising. Add 15g (1 level scoop) of Amino Complex to 600ml of water. Shake or blend until mixed and serve. Use 30 minutes prior to exercise, during exercise, or immediately after exercise. INGREDIENTS: Amino Acids (67%) [L-Leucine, L-Glutamine, L-Isoleucine, L-Valine, L-Arginine, L-Lysine Hydrochloride, L-Phenylalanine, L-Threonine, L-Methionine, L-Histidine, Emulsifier (Soy Lecithin)], Acidity Regulators (Citric Acid, Malic Acid, Sodium Bicarbonate), Beetroot Juice Powder (3%), Ornithine, Natural Flavours, Natural Sweeteners (Steviol Glycosides, Thaumatin), Licorice Root, Natural Colour (Curcumin), Vegetable Gum (Guar Gum), Anti-Caking Agent (Silicon Dioxide).